From the heights of society down to the saddest corners of America, we are currently experiencing an epidemic of “wilding”—acts of self-interested violence or greed that weaken the social fabric. 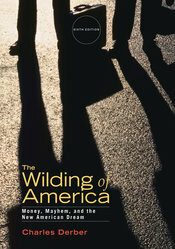 Derber’s fully updated Sixth Edition of The Wilding of America takes the reader on a terrifying tour of this out-of-control individualism spreading across the United States. Three exciting new chapters—Chapter 6, Sociopathic Capitalism; Chapter 7, Vigilante Justice; and Chapter 8, Wilding Against the Environment—bring fresh insight to American culture with coverage of the bankruptcy of Detroit; the shooting of Trayvon Martin; and the degradation of the environment. Additionally, each chapter of the new edition has been thoroughly updated with the most current coverage of wilding by universities, athletes, and the entertainment industry, global sweat shops, the Obama administration, the Occupy movement and much more. This thoroughly updated edition also includes all new discussion questions for each chapter, and wraps up with inspiring ideas of how the reader can fight the wilding crisis at home, in school, and in her everyday life. The Wilding of America asks readers to take action, and offers a hopeful vision of for how we can all make our world a better place.